Following mounting criticism about her anti-Israeli sentiments in Congress, and on Twitter, Rep. Ilhan Omar (D-MN) was compelled to release the following statement. In it, she thanks her Jewish colleagues for "educating" her on the harms of anti-Semitism. She "unequivocally apologizes" for her rhetoric. Judging by her extra note at the bottom of the above "apology," however, she doesn't exactly feel bad about accusing Republicans of supporting Israel because of the fundraising that accompanies it. "It's all about the Benjamins baby," she wrote on Twitter over the weekend. Omar has also tweeted her belief that Israel has "hypnotized the world." As recently as last month, she wondered aloud how those sentiments could be interpreted as offensive. She also knowingly supports the BDS movement, a campaign that promotes the boycotting of Israeli goods and services. When Manu Raju tried to get an explanation out of her, she ran away. 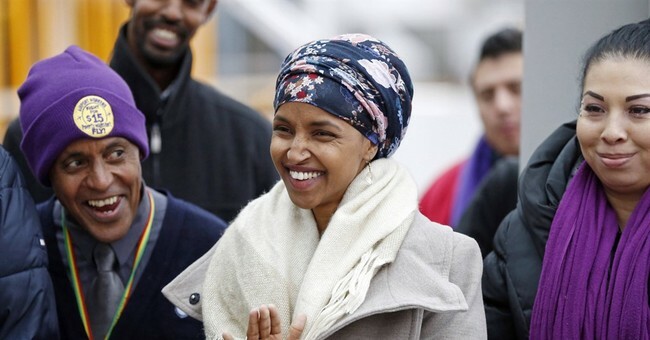 Omar's recent remarks have been received so poorly that Democratic leadership distanced themselves from her on Monday. "Congresswoman Omar’s use of anti-Semitic tropes and prejudicial accusations about Israel’s supporters is deeply offensive," House Speaker Nancy Pelosi and other Democratic leaders wrote. "We condemn these remarks and we call upon Congresswoman Omar to immediately apologize for these hurtful comments."